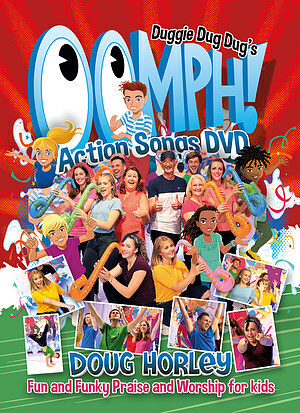 You'll have a whole bunch of fun with this new DVD as Doug and his team of dancers teach you the actions to 11 songs from his fabulous praise and worship CD - "Oomph!". With high energy songs, quieter and moving sign language songs as well as lots of fun and laughter, the DVD is ideal for use in children's worship times, kid's clubs, at home or in school. The songs are also great for all age worship too. As well as performance versions of each song the DVD also has a detailed instruction section for the actions. Oomph! Action Songs DVD by Doug Horley was published by Essential Christian in April 2019 and is our 1406th best seller. The ISBN for Oomph! Action Songs DVD is 5021776236245. Be the first to review Oomph! Action Songs DVD! Got a question? No problem! Just click here to ask us about Oomph! Action Songs DVD.